Electric vehicle-charging stations are springing up all over the Catskills. Here’s a list within the Catskill Park Boundary and within the NYC watershed starting north at the Schoharie Reservoir on Route 30, and running south though the Catskills down to Roscoe on Route 17. Click on the links to Google Maps. Take a tour through the mountains in your electric vehicle, see the sights and charge up along the way. Also noted: nearby inns or restaurants. Cell service is intermittent in the Catskills, especially between Andes and Delhi, and between Big Indian and Phoenicia, so physical maps are still essential for this area. 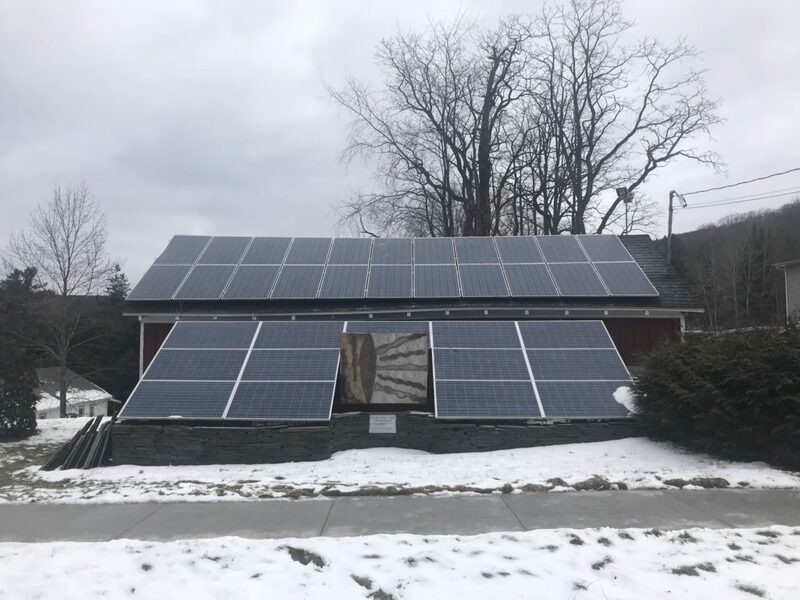 Blenheim-Gilboa Power Project, 397 Power Plant Access Rd, Gilboa, NY 12076. A pretty remote part of the Catskills by the Schoharie Reservoir. Close by: Heather Ridge Farm, Restaurant & Store, open year-round. Village of Hobart Public Parking, 11 Cornell Ave Hobart NY 13788. Nearby: Bull & Garland (closed until March 2019), The Sheep’s Nest. Hobart “Book Village”: a magical bibliophile’s paradise nestled in one of the most scenic areas of the Catskills. Delaware County Electric Co-op, 39 Elm Street, Delhi, NY 13653. Nearby: Brushland Eating House, Catskills Regional Harvest Farm Store, Goldenrod, Tay Tea, Catskills Momo Tibetan Restaurant. Spotty cell service in surrounding areas. Know before you go. Town of Colchester EV Charging station at the Downsville Diner at 15185 State Highway 30, Downsville, New York 13755. Winwood Inn, 5220 NY-23, Windham, NY 12496. Nearby ski mountain and Windham Country Store, which does a fantastic Mean Green Burger using jalapeño mayonnaise. Windham Mountain, 33 Clarence D Lane Road, Windham, NY, 12496. See above. Village of Margaretville Public Parking, 48 Walnut Street, Margaretville, NY 12455. Nearby: Picnic, Trattoria Locale, The Cheese Barrel, The Binnekill Tavern, all on Main Street. Cell service here. State Trooper station about a mile west of here on Route 28/30. Emerson Resort & Spa, 5340 Route 28, Mt Tremper, NY 12457. Nearby: Phoenicia Diner Route 28 (try the everything), Peekamoose on Route 28, The Pines on Route 212. Cell service drops for a while in surrounding areas. Know before you go. Woodstock Community Center, 56 Rock City Rd, Woodstock, NY 12498. Nearby: Garden Cafe, Upstate Films, The Tea Shop of Woodstock. a good wine store and all the delights of Woodstock further out into the village. Bread Alone Bakery, 3962 NY-28, Boiceville, NY 12412. Bread Alone does a nice Hudson River Breakfast. Nearby: Boiceville Supermarket, the Goods Luncheonette, try the fish and chips. Frost Valley YMCA, 2000 Frost Valley Rd Claryville, NY 12725 No cell service in area. Take a map. There’s no eating around here, only hiking. Roscoe Diner, 1908 Old Rt 17, Roscoe, New York 12776. Roscoe Brewery, 145 Rockland Road, Roscoe, NY 12776. Catskills Brewery, 672 Old Rte 17 Livingston Manor, NY 12758. All addresses provided by Plugshare: use the website or download the app to see more details or plan a trip. This entry was posted in Visit Catskills on February 10, 2019 by JNUrbanski. You left out the ChargePoint station in Town of Colchester EV Charging station at the Downsville Diner at 15185 State Highway 30, Downsville, New York 13755! It charges all electric cars! Please include us.